User engagement is a highly desired feature of user interfaces, yet it fails to sufficiently articulate the most extreme type of engagement - flow. 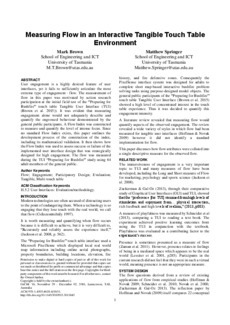 The measurement of flow in this paper was motivated by action research participation at the initial field test of the "Preparing for Bushfire" touch table Tangible User Interface (TUI) (Brown et al. 2015). It was evident that measuring engagement alone would not adequately describe and quantify the engrossed behaviour demonstrated by the general public participants. A Flow Index was constructed to measure and quantify the level of intense focus. Since no standard Flow Index exists, this paper outlines the development process of the construction of the index, including its mathematical validation. It then shows how the Flow Index was used to assess success or failure of the implemented user interface design that was strategically designed for high engagement. The flow was measured during the TUI "Preparing for Bushfire" study using 64 adult members of the general public.